Did more old people than young people vote Remain? According to a YouGov poll on the day of the referendum, 75% of people in the 18-24 age group voted for Remain, compared to 39% in the 65+ age group. I was able to locate two different sources of estimated turnout by age group: a Sky Data poll, and an analysis of data from a Lord Ashcroft poll by Future Canon. According to the Sky Data poll, turnout in the 18-24 age group was 36%, whereas turnout in the 65+ age group was 83%. This implies that 0.75*0.36 = 27% of young people voted Remain, and that 0.39*0.83 = 32% of old people voted Remain. According to the analysis by Future Canon, turnout in the 18-24 age group was 32%, whereas turnout in the 65+ age group was 78%. This implies that 0.75*0.32 = 24% of young people voted Remain, and that 0.39*0.78 = 30% of old people voted Remain. Having said that, these turnout figures do seem a little implausible. Is it really true that only 32-36% of young people voted? If one instead relies on Ipsos MORI's figures for the last general election, then turnout in the 18-24 age group was 43%, while turnout in the 65+ age group was 78%. This implies that 0.75*0.43 = 32% of young people voted Remain, and that 0.39*0.78 = 30% of old people voted Remain. Overall, it is not implausible that the proportion of old people who voted Remain is similar to (or even greater than) the proportion of young people who voted Remain. Of course, many more old people than young people voted Leave. The reason for my email is that I would like to ask you about an issue not dealt with in the video––which I personally see as the most important one in the debate––namely that we do not appear to face a choice between leaving and staying in the EU as it currently exists, but between leaving and staying in an EU which is moving toward further political integration. I am quite happy to acknowledge that our current membership of the EU is a net positive for the economy, or at the very least not a net negative. However, the real issue to me is not whether our current membership is a net positive for our economy, but whether our future membership will be a net positive for our society. Is your view that a) the EU will not move toward further political integration in the future, or b) it will move toward further political integration in the future, and this will be good for the British people? Thanks for your email. Without meaning any offence, the only people I ever hear talking about the EU becoming a federal (super)state are the people who hate the idea. No-one I know working in the field of the EU – and that is a very large number of people in all walks of life – ever thinks about it! And there are two reasons. First, Treaty changes – including of the sort that would be needed to “further integrate” the EU – require unanimous agreement by the 28 Member States followed by 28 national ratification processes. In the UK, that would almost certainly mean… another national referendum on the EU! After all, the European Union Act 2011 requires a national referendum in the UK for any future EU reform which would involve even the slightest increase in the competences of the EU at the expense of the UK. Secondly, the peoples of Europe clearly don’t want a federal superstate: can Leave name a single country that would support this (as opposed to some 1950s statements from a dead politician or the weird musings of some minor living one)? Many thanks for getting back to me so quickly. No offence taken. However, I would make three points in response. Second, if a European federal state were not the ultimate end point, why does the EU have a motto, an anthem, a flag, an annual holiday, a mascot, and even a personification (the mythological figure Europa)? Third, as I noted in the blog post I linked you to in my first email, much deeper fiscal integration is arguably needed to make the Eurozone work. Every single fixed exchange rate has cracked in the end. We’re all at different levels of development of our economies. Some countries simply couldn’t live up to a single currency. It would mean massive extra subsidies from the rest of us for them or massive movements of immigration from their countries into ours. Both would cause resentment and not produce harmonious development. Europe’s common market exemplifies a situation that is unfavourable to a common currency. It is composed of separate nations, whose residents speak different languages, have different customs, and have far greater loyalty and attachment to their own country than to the common market or to the idea of “Europe”. Despite being a free trade area, goods move less freely than in the United States, and so does capital. The drive for the Euro has been motivated by politics not economics. The aim has been to link Germany and France so closely as to make a future European war impossible, and to set the stage for a federal United States of Europe. I believe that adoption of the Euro would have the opposite effect. It would exacerbate political tensions by converting divergent shocks that could have been readily accommodated by exchange rate changes into divisive political issues. As the quotations above imply, in order to make the Eurozone work, much greater fiscal integration of Eurozone economies is required. Employment and industrial law will need to be harmonised still further; various tax and spending powers will need to be transferred to Brussels; and far higher levels of inter-state migration will need to be encouraged. For illustration, compare the EU to the United States––a rather more successful monetary union. Whereas the EU (of which the Eurozone comprises the larger part) accounts for only ~3% of spending in Europe, the US federal government accounts for ~60% of spending in America. Whereas rich EU countries such as the Netherlands make net contributions on the order of 0.4% of GDP, rich US states such as Connecticut run net fiscal balances (federal taxes paid minus federal spending received) on the order of 5% of GDP. And whereas just ~4% of people who were born and still reside in the EU live outside their country of birth, ~31% of people who were born and still reside in the US live outside their state of birth. Is wholesale fiscal integration of Eurozone economies achievable? Evidence from surveys and opinion polls suggest that it is very likely not. First, despite the EU’s extensive efforts to cultivate a Pan-European identity, Europeans continue to identify more with their nation than with Europe as a whole. There is no European demos. In the 2014 wave of the Eurobarometer survey, respondents were asked to say whether they identified: with their country only; with their country first, then Europe; with Europe first, then their country; or with Europe only. The average proportion identifying with their country only or with their country first was >90%; in no country did less than 75% of people identify as such. And if we again turn our attention to the United States, we see a starkly different picture. Only a tiny fraction of Americans––around 7%––identify more with their state than with the United States itself. Second, when questioned specifically about taxation, social spending and employment law, most Europeans are decidedly sceptical about further centralisation. In the 2005 wave of the Eurobarometer survey (administered before the financial crisis), respondents were asked to state, for each of a number of policy areas, whether they believed decisions should be taken separately at the national level or jointly at the EU level. Only 39% supported joint decision-making on fighting unemployment; only 29% supported joint decision-making on health and social welfare; and only 25% supported joint decision-making for taxation. Third, there appears to be little appetite for softening the terms of the Greek bailout deal among citizens of the rich, creditor nations in Northern Europe. A YouGov poll conducted in July of 2015 found that 53% of Swedes, 61% of Germans, 64% of Danes and 74% of Finns were opposed to any renegotiation of Greece’s debt repayments. Moreover, sizable majorities in each of these countries––65% in Sweden, 59% in Germany, 70% in Denmark and 73% in Finland––blamed the Greek crisis squarely on successive Greek governments, rather than on either the troika (the EU, the IMF and the ECB) or on both Greek governments and the troika. The same poll found that 47% of Germans expressed a preference for Greece to leave the Eurozone. This percentage had risen to 59% in another YouGov poll carried out one month later. Brexit will remain a live issue unless the eurozone can sort itself out. That means either admitting that the euro has been a terrible mistake, or going the whole hog and integrating further, with a single banking system, a Europe-wide treasury, and a democratically elected finance minister with the power to raise money in Germany and spend it in Greece. This is not going to happen any time soon, and perhaps never. Recently, YouGov asked the British public which groups benefit or lose out most from the European Union. Specifically, they asked respondents to select up to 3 groups from a list of 12 which they believed benefit most from the EU, and 3 groups which they believed lose out most from the EU. I calculated the balance of opinion on each group as the percentage of respondents who identified it as benefiting from the EU minus the percentage who identified it as losing out from the EU. For each group, I then obtained an estimate of the percentage of group members who want the UK to remain in the EU, as well as the percentage who want the UK to leave the EU. The estimates for big business were obtained by averaging across the percentages reported by the CBI for the ADS, the BCC, the CIA, the CECA, the CBI, the FDF, the SMMT and TechUK. The estimates for the finance industry were obtained by averaging across the percentages reported for the BBA, Deloitte and Goldman Sachs. The estimates for small business were obtained by averaging across the percentages reported for the FSB and the percentages reported in a recent YouGov poll. The estimates for farmers were obtained from a recent poll by Farmers Weekly. The estimates for politicians were obtained from the list of MPs compiled by Euro Guido. Estimates for the well-off, students, the unemployed, the employed, the poor, and pensioners were obtained from the 2015 wave of the British Election Study (BES) panel. (Because the overall sample in the BES was skewed toward Remain (relative to now, 47–34), I subtracted 2 percentage points from each Remain percentage, and added 8 percentage points to each Leave percentage.) I could not find estimates for trade unions. I calculated the balance of opinion on whether the UK should leave the EU within each group as the the Remain percentage minus the Leave percentage. 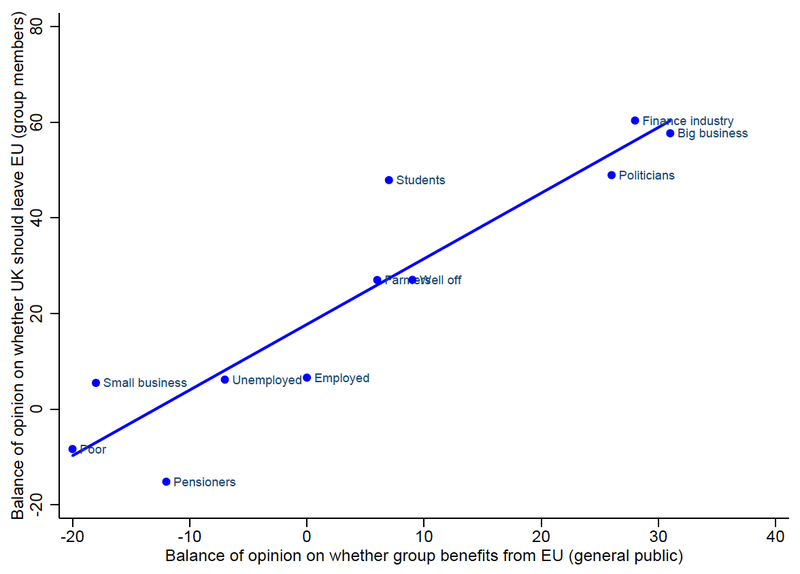 The chart below plots this balance of opinion against the balance of opinion on whether each group benefits from the EU. There is a remarkably strong association between the two variables (r = .93, p < 0.001). Groups that the public believes benefit more from the EU tend to be more pro-Remain. This is perhaps not surprising, however. It could simply be that members of the public evaluate how much each group benefits from the EU by reviewing instances they can recall of each group arguing for or against the EU. In other words, they assume that groups (e.g., big business) who tend to write letters to newspapers or appear on television arguing in favour of the EU must benefit more from the EU. The chart below, based on data from the IMF, shows change in real GDP per capita in Chile and Venezuela since 1980. 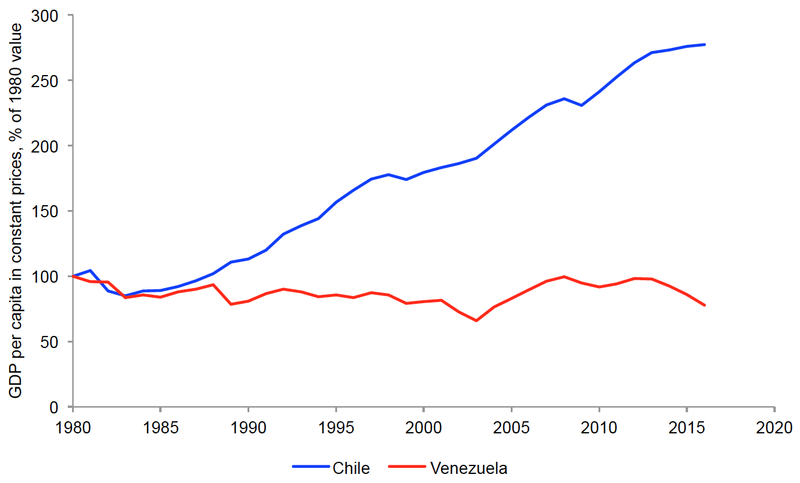 GDP per capita has increased by 177% in Chile, but has fallen by 22% in Venezuela. According to the CIA World Factbook, 14% of Chileans live in poverty, compared to 32% of Venezuelans (the latter figure, from 2013, is almost certainly an underestimate). A pre-requisite for the establishment of a European superstate is a sense of Pan-European identity among the people of Europe. That is to say, Europeans will be unlikely to accept substantial transfers of sovereignty from their national parliaments to Brussels until enough of them identify more with Europe than with their own country. As I have noted before, this sense of Pan-European identity is not particularly widespread in Europe at the present time. An interesting comparison is between the European Union on the one hand and the United States on the other (especially given Churchill's famous declaration in 1946 that "we must build a kind of United States of Europe"). The EU and the US are similar to one another in that each constitutes a federation of partially sovereign states. The key differences between them are: political structure (e.g., the US president is directly elected, whereas the president of the European Commission is appointed), and the amount of power wielded by central government (e.g., the US federal government accounts for ~60% of spending in the US, whereas the EU accounts for ~3% of spending in Europe). 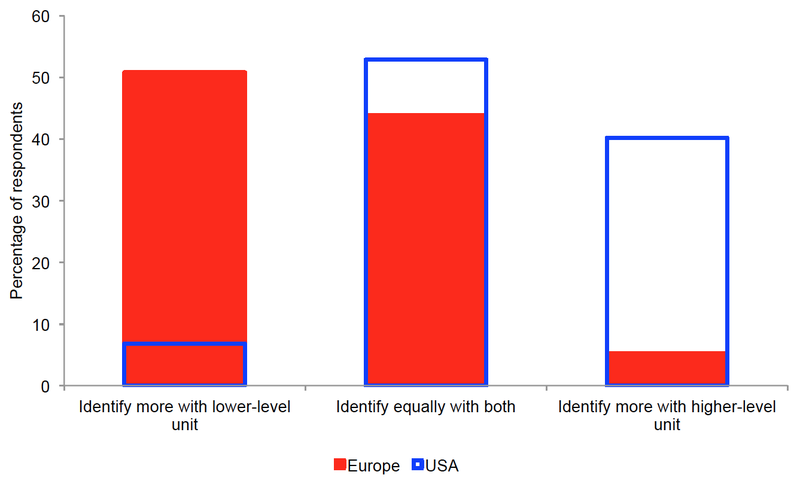 In order to compare the relative importance of identity at different levels within Europe and the United States, I analysed data from the Eurobarometer survey and the US General Social Survey (GSS). Various waves of the Eurobarometer ask respondents to say how attached they feel to a) their country and b) Europe, on a scale from "very attached" to "not at all attached". Similarly, several waves of the GSS ask respondents to say how close they feel to a) their state and b) the USA, on a scale from "very close" to "not close at all". Only 5% of Europeans identify more with Europe than with their own country, whereas 40% of Americans identify more with the USA than with their own state. And only 7% of Americans identify more with their own state than with the USA, whereas 51% of Europeans identify more with their own country than with Europe. 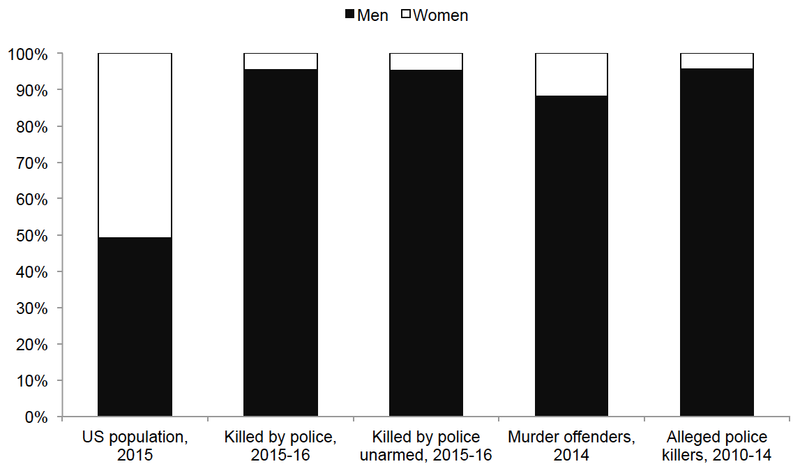 Note that the relatively high proportion of respondents identifying equally with both is likely due to the limited number of response categories available. By way of example, if there had been only two response categories available (e.g., 1, "identify"; and 0, "do not identify"), since most respondents identify at least a little bit with both levels, almost everyone would be assigned a zero on the variable measuring the extent to which he identifies more with the higher-level unit. Thus, the foregoing results almost certainly constitute a conservative assessment of the difference between Europeans and Americans. How much revenue is hidden away in tax havens? In light of the recent Panama Papers scandal, it is worth considering how much revenue is actually hidden away in tax havens. 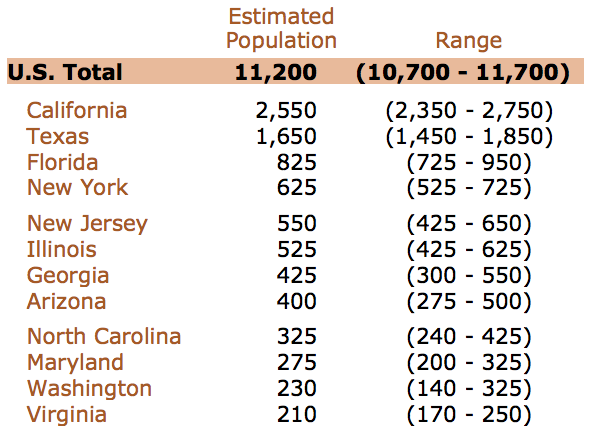 The most widely cited estimates seem to be from a paper by Zucman (2014; Journal of Economic Perspectives, Table 1). These estimates are cited in a recent report by Oxfam (p. 12), entitled 'Ending the Era of Tax Havens: Why the UK Government Must Lead the Way'. And very similar figures are offered in a recent report by the Tax Justice Network (p. 42), entitled 'The Price of Offshore Revisited'. My method probably delivers a lower bound, in part because it only captures financial wealth and disregards real assets. After all, high-net-worth individuals can stash works of art, jewelry, and gold in “freeports,” warehouses that serve as repositories for valuables—Geneva, Luxembourg, and Singapore all have them. High-net-worth individuals also own real estate in foreign countries. For comparison, tax revenues in the UK decreased by 4.5% between 2007 and 2009, over the course of the financial crisis. In recent years, do you think too much has been made of the problems facing black people, too little has been made, or is it about right? I recoded the variable so that respondents answering "too much" were distinguished from those answering either "about right" or "too little". Crucially, the poll also included the race of the interviewer for each individual respondent. Thus, I investigated social desirability bias by examining the effect of having a black interviewer on white respondents' answers to the above question on race relations. 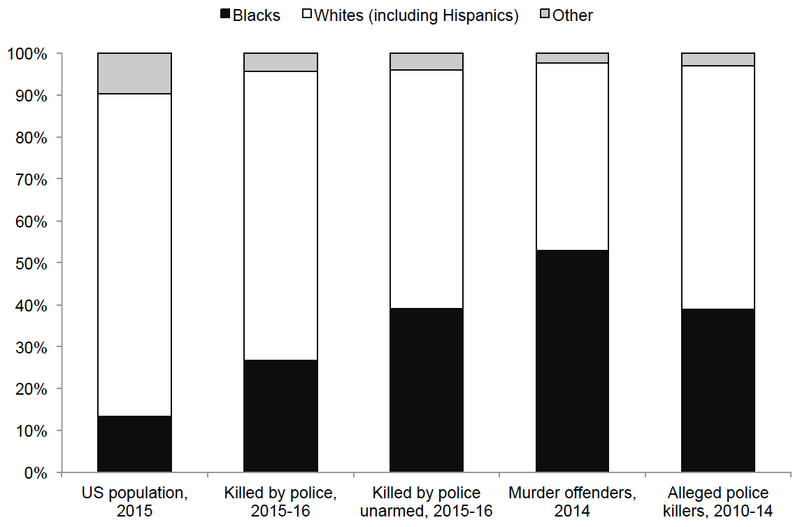 The table below shows coefficients from linear probability (i.e., OLS) models of believing that too much has been made of the problems facing black people. The sample is restricted to whites (who in any case comprised the vast majority of respondents). The value in the left-hand column indicates that whites with a black interviewer were 15 percentage points less likely to answer "too much" than whites with a white interviewer. And the values in the other columns indicate that this effect remains unchanged when controlling for a range of socio-demographic characteristics. 15 percentage points is arguably a fairly large difference. Indeed, 38% of whites with a white interviewer answered "too much", whereas only 23% of whites with a black interviewer did so. A couple of days ago, The Federalist published a long article entitled 'Why So Many Millenials are Socialists', the main explanation being that relatively few millenials seem to understand what socialism is. 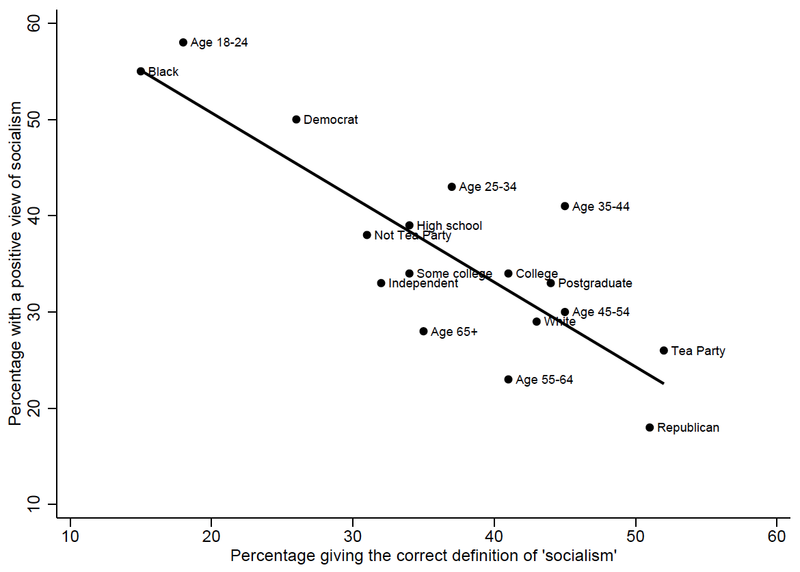 To investigate whether, in general, Americans with a better understanding of socialism view it more or less positively, I examined data from a poll conducted by CBS News and The New York Times in April of 2010. Respondents were asked the question, "When someone says the country is moving toward socialism, what does that mean to you?" The correct (and modal) answer, given by 37% of respondents, was "government ownership of the means of production". The most-frequently given wrong answers were: "redistribution of wealth" (9%), "taking rights away from people" (9%), and "a bad thing" (4%). Unfortunately, the CBS/NYT poll did not ask respondents for their view on socialism. Happily, however, a Reason/Rupe poll from August 2014 did ask respondents for their view on socialism. (Since the two polls surveyed completely different individuals, it is only possible to conduct an analysis at the aggregate level.) Percentages with a positive and negative view of socialism were reported for various different socio-demographic groups: whites, blacks, Republicans, Democrats, etc. 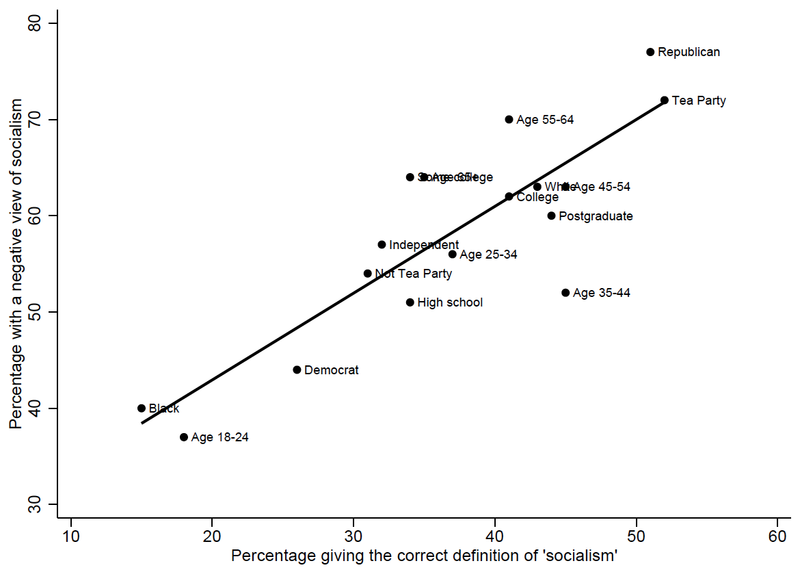 Accordingly, I calculated the percentage giving the correct definition of 'socialism' for each of those same socio-demographic groups, using the CBS/NYT poll (sampling weights were applied in order to attain representativeness). For example, 29% of whites in the Reason/Rupe poll had a positive view of socialism, and 43% of whites in the CBS/NYT poll gave the correct definition of 'socialism'; 55% of blacks in the Reason/Rupe poll had a positive view of socialism, and 15% of blacks in the CBS/NYT poll gave the correct definition of 'socialism'. The two charts below plot percentage giving the correct definition of 'socialism' against: respectively, percentage with a positive view of socialism, and percentage with a negative view of socialism. In both cases, there is a very strong relationship. Socio-demographic groups who are better at defining 'socialism' are less likely to view it positively, and are more likely to view it negatively. The correlations (controlling for group fixed-effects) are: r = –.85 and r = .86, respectively. Of course, since the various groups overlap with one another, and are therefore not at all independent, these figures should be interpreted with considerable caution. YouGov recently ran a poll of business leaders' stance on the European Union. Interestingly, and consistent with previous findings, there was a huge gap between small business and big business. Among, SMEs, 42% answered "leave" and 47% answered "remain". By contrast, among FTSE companies, only 7% answered "leave" while 93% answered "remain". One interpretation of these results is that leaving the EU would be bad for Britain's largest businesses, and would therefore be deleterious to the economy as a whole––large businesses, though small in number, account for a disproportionate share of both output and employment. Another interpretation, however, is that large businesses tend to support the EU because they can use it to gain special privileges at the expense of their competition. Euroscepticism is widely regarded as a conservative position. Indeed, in the most recent YouGov poll, only 30% of Conservatives and only 2% of UKIP supporters said the UK should remain in the European Union, compared to 60% of Labour supporters, 63% of Lib Dems, and 69% of other voters (mostly Greens and SNP supporters). Nonetheless, as I have noted before, there are and have been many prominent left-wing eurosceptics. One such eurosceptic was the late Tony Benn. But we must recognise that the European Community has now set itself the objectives of developing a common foreign policy, a form of common nationality expressed through a common passport, a directly elected assembly, and an economic and monetary union which, taken together, would in effect make the United Kingdom into one province of a Western European State. The communiqué issued after the recent Paris summit makes these objectives clear. Britain's continuing membership of the Community would mean the end of Britain as a completely self-governing nation and the end of our democratically elected Parliament as the supreme law-making body in the United Kingdom. Benn reiterated his euroscepticism at the Oxford Union in 2013: "They're building an empire there, and they want us to be a part of that empire, and I don't want that". Bernie Sanders, one of the contenders for the Democratic nomination in the US presidential race, has a mixed record on the issue of immigration. He voted against the 2007 Comprehensive Immigration Reform Act, and has voted against guest worker schemes, yet he voted for the 2013 Border Security, Economic Opportunity, and Immigration Modernization Act, and claims to support a path to citizenship for illegal immigrants. In fact, the anti-immigration organisation NumbersUSA gives him an F– grade. My concern about the bill that I voted against was that there was too much emphasis on bringing low-wage workers into this country. There is a reason that Wall Street likes immigration reform. What I think they’re interested in is seeing a process by which we can bring low-wage labor into this county. What they are talking about is completely opening up the border. That was the question, should we have a completely open border, so that anybody can come into the United States of America. If that were to happen, which I strongly disagree with, there is no question in my mind that that was substantially lower wages in this country. When you have 36 percent of Hispanic kids in this country who can’t find jobs, and you bring a lot of unskilled workers into this country, what do you think happens to that 36 percent of kids who are today unemployed? Fifty-one percent of African-American kids? I don’t think there’s any presidential candidate, none, who thinks we should open up the borders. If poverty is increasing and if wages are going down, I don’t know why we need millions of people to be coming into this country as guest workers who will work for lower wages than American workers and drive waged down even lower than they are now. It does not make a lot of sense to me to bring hundreds of thousands of those workers into this country to work for minimum wage and compete with Americans kids. Open borders? No, that’s a Koch brothers proposal. That’s a right-wing proposal that essentially says there is no United States. It would make everybody in America poorer––you're doing away with the concept of a nation state, and I don't think there's any country in the world that believes in that. If you believe in a nation state or in a country called the United States or UK or Denmark or any other country, you have an obligation in my view to do everything we can to help poor people. The Brookings Institution just published a report on black-white segregation in major US cities. The chart below plots a segregation index, taken from the Brookings report, against a conservatism index, taken from the paper by Tausanovitch and Warshaw (2014). The value of the segregation index is equal to the fraction of blacks that would have to move neighbourhoods in order to match the distribution of whites. 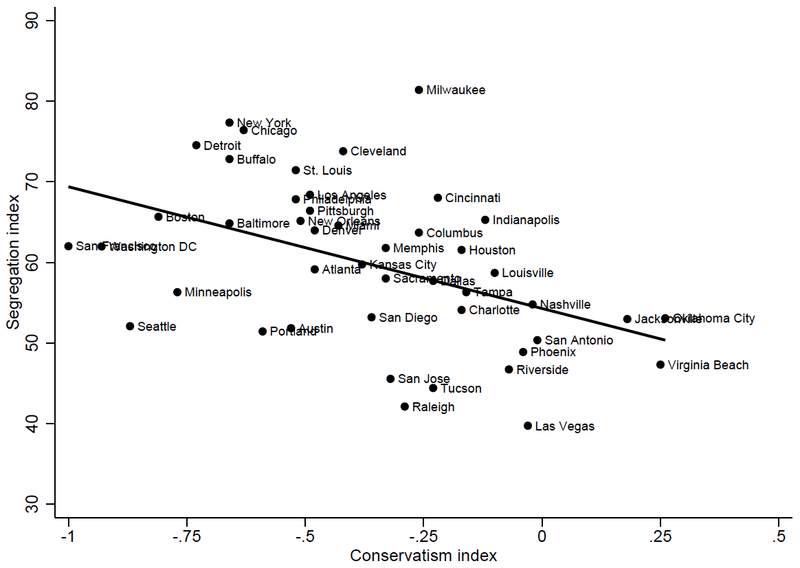 The conservatism index is based on aggregation of opinion poll data from different US cities. The Pearson correlation is r = –.46 (p = 0.002). This remains unchanged when controlling for the fraction black: β = –.46 (p = 0.001). Regular readers may recall a previous post reporting that the black/white incarceration rate ratio tends to be higher in Northern states. Other evidence indicates that progressive cities tend to be less affordable, exhibit higher income inequality, and have greater black-white inequality. In all these cases, of course, it is not precisely obvious which way causality is running. More restrictive planning regulations in progressive cities might be one culprit. In November of 2015, the University of New Hampshire Survey Centre conducted a survey of economists on the minimum wage. The survey was conducted on behalf of the Employment Policies Institute––a right-wing think tank. However, 59% of those who responded identified as Democrat, with 34% identifying as Independent and only 7% identifying as Republican. 166 economists answered the survey in total, corresponding to a response rate of 30%. The first major finding was that 60% of economists in the sample favoured some increase to the federal minimum wage. The chart below plots the distribution of responses to the question, "Currently the federal minimum wage is $7.25 per hour, do you support or oppose raising the federal minimum wage at all?" The second major finding was that nearly 75% of economists in the sample opposed raising the federal minimum wage to $15/hour, as advocated by politicians such as Bernie Sanders. The chart below plots the distribution of responses to the question, "Currently the federal minimum wage is $7.25 per hour, do you support or oppose raising the federal minimum wage to $15 per hour?" In fact, the average minimum wage preferred by economists in the sample was $9.59/hour. Respondents were about evenly divided over whether a $15/hour minimum wage would increase or decrease the poverty rate. But the vast majority agreed that it would have a negative effect on employment, and that it would make it harder for small firms to stay in business.